CULVER CITY, Calif. (Mar. 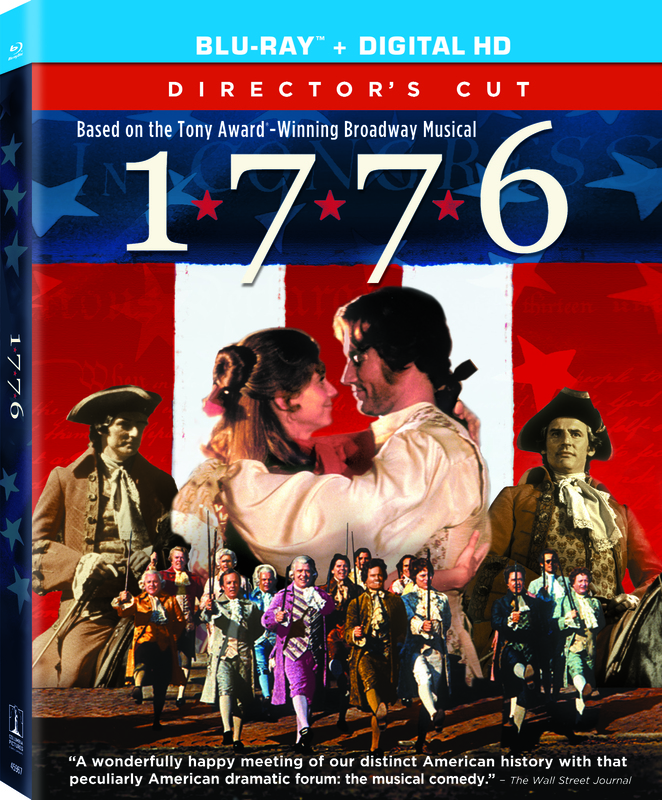 26, 2015) – Based on the international stage triumph that won the Tony Award and The New York Drama Critics Circle Award as “Best Musical of the Year,” the musical classic 1776 makes its Blu-rayTM debut June 2 from Sony Pictures Home Entertainment. The Director’s Cut was meticulously restored by Sony Pictures Entertainment in 4K at Sony Pictures’ Colorworks from the original camera negative. Prepared under the guidance of Director Peter H. Hunt and Sony Pictures Entertainment Executive Vice President of Asset Management, Film Restoration and Digital Mastering Grover Crisp, the new Director’s Cut restores the film to its original visual brilliance and features newly discovered material. The Blu-ray includes an all-new commentary with Director Peter H. Hunt, William Daniels and Ken Howard, as well as deleted scenes and original screen tests with William Daniels and Howard Da Silva. In addition to the Director’s Cut, the Blu-ray also presents an Extended Cut of the film via seamless branching, along with a newly restored and remixed 5.1 soundtrack. “We worked tirelessly to return this film to as pristine a condition as possible and are excited to bring the newly restored version of 1776 to audiences worldwide,” Crisp said of the restoration, which will have its world premiere screening March 28 at the TCM Classic Film Festival. (Meet the Parents) as Martha Jefferson. The restored Director’s Cut is based, in part, on an earlier restoration carried out for a 2002 DVD release. That version, also prepared with Hunt’s oversight, added a number of scenes and lost elements that were missing from the original theatrical release. Among them was a musical number that had been dropped from the film by Warner at the request of President Richard Nixon (who felt the scene cast conservatives in an unfavorable light). Further detective work for the new version uncovered additional “lost” material, including dialogue that had been changed over ratings concerns. State-of-the-art 4K digital technology made it possible to address problems and restore color fidelity to a level not possible at the time of the earlier restoration, which was done through photochemical processes. Variations in color, due to different levels of degradation in negative elements, have been eliminated as much as possible, resulting in a seamless look. “When a scene comes up that had been cut out or compromised in some way, it looks like it is supposed to be there because we could maintain consistency with the image and keep its natural filmic quality,” Crisp explained. Colorworks Colorist Sheri Eisenberg said that much time was spent studying existing film prints and other reference material in order to ensure the restoration accurately represented the movie in its original form. Hunt said that, in some ways, the results go beyond the original. 1776 is a musical celebration of the founding of the United States of America based on the award-winning Broadway production. The story centers around the familiar historical characters as they organize a movement for independence from Mother England: the tough unyielding John Adams (William Daniels); the charming and pragmatic Benjamin Franklin (Howard Da Silva); the brilliant young Thomas Jefferson (Ken Howard), who is chosen to write the Declaration of Independence even as he longs for the company of his new bride Martha (Blythe Danner); and the rest of the Continental Congress. All events lead up to that most significant date July 4, 1776 when the Declaration was signed. Now fully restored for its high definition debut on Blu-ray, 1776 looks and sounds better than ever. Based on the musical produced on the stage by Stuart Ostrow, 1776 was directed by Peter H. Hunt from a screenplay by Peter Stone. Music and Lyrics by Sherman Edwards. 1776 was produced by Jack L. Warner. 1776 has a run time of approximately 166 minutes and is not rated. “Academy Award ” is the registered trademark of the Academy of Motion Picture Arts and Sciences.